The kitchen can cater for 3 course meals for 100 persons as well as buffet and refreshment functions for smaller numbers. 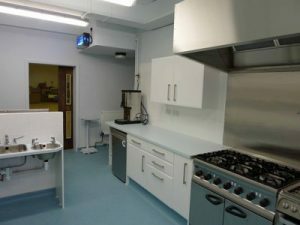 Designated areas for preparation, cooking, and serving are provided, including a worktop at a lowered height for disabled and younger persons. Two mobile ‘counters’ can be configured for ‘Bar’ or ‘Buffet’ function within the adjacent Hall or moved to provide additional preparation and serving areas. Equipment includes a high speed dishwasher, two boiling hot water dispensers, two ovens (one 6-burner range and one 4-burner domestic cooker), high level grill, microwave, fridge, freezer, toaster, crockery, cutlery, utensils, jugs, glasses and saucepans.